There are several grades of ylang ylang essential oil which are extracted at different times during the flower’s lengthy distillation. The superior ylang extra is drawn off during the initial phase. Next, ylang II is extracted and finally ylang III or the complete oil that results from the full, uninterrupted distillation of the flowers. 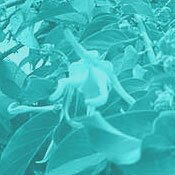 Ylang oil is distilled from the cananga tree’s greenish-yellow, starfish-shaped flowers, produced year-round. The fresh blossoms have traditionally been used to infuse coconut oil with their heavy fragrance. This scented coconut oil, known as Macassar oil, is used as a hair dressing in the South Pacific. Personal fragrance manufacturers are the primary users of ylang oil today. Ylang is a component of many men’s fragrances, probably because its floral sweetness is so unlike rose, which is often used as a modifier in feminine perfumes. High blood pressure, Depression, Palpitations, General Tonic.